Opera is one of those things you either love or hate. For most members of Gen-y, the latter view prevails; we have all heard the jokes of ‘fat lady singing’ and the likes. Yet, if there was ever an opera to challenge the view of the genre as out-dated and inaccessible, Opera Australia’s production of Salome is it. The cutting-edge interpretation of Richard Strauss’ iconic opera is full of the intensity that shocked audiences when it premiered in 1905. After showing to rave reviews in Sydney, Salome began its run at the State Theatre, the Arts Centre Melbourne this month, where it is has enjoyed equal success. Director Gale Edwards offers a new twist on the lewd tale of Salome. The opera offers a dramatic retelling of the Biblical story of the femme fatale Salome (Cheryl Barker), the stepdaughter of Herod (John Pickering) and daughter of Herodias (Jacqueline Dark). Like any great opera, the timeless themes of jealousy, love and misfortune abound. Herod’s licentious infatuation with Salome, countered by her own unrequited love for Jokanaan (St John the Baptist, performed by Thomas Hall) sets the story in motion. Herod promises to grant Salome’s any wish if she performs for him the Dance of the Seven Veils, which she does, only to horrify the king by requesting the head of Jokanaan on a silver platter. Audience members themselves were at once awed and revolted as they watched Salome caress the severed head during the opera’s dénouement. The dance is one of the iconic scenes within the operatic tradition, and was chilling executed by Barker. This production of Salome exemplifies how opera – at its best – powerfully combines different art mediums: music, costume, drama, dance and design. Resulting in what the Romantic composer Richard Wagner termed the Gesamtkunstwerk (literally, the ‘total work of art’), opera is, at its best, an intense and immersive creative experience that enthrals and amazes audiences. Salome certainly had this effect on me. The abattoir-themed set, designed by Brian Thomson, emphasised the opera’s macabre premise. It featured a backdrop of animal carcasses, with a palette of menacing blacks and reds used for the scenery. The macabre set had more in common with The Silence of the Lambs than the landscape of Classical antiquity from which the story originates. Coupled with provocative costumes by Julie Lynch that would also not be out of place in a horror film, Salome had a contemporary feel. This, no doubt, appeals to younger audiences and those tired of Australia’s somewhat conservative opera calendar. The cutting-edge atmosphere of the production complemented the story of desire and revenge. In following Strauss’ libretto, Salome ran without intermission, being unusual for an opera in having just one act (it is not uncommon for operas to have two intervals, and run for more than three hours). The ninety plus minutes of the performance were filled with passion, energy and gore that held the audience’s attention. Conductor Simon Hewett’s interpretation of Strauss’ formidable score was impressive. Romantic at times, and grating at others, the powerful music of Salome perfectly captures the opera’s juxtaposition of beauty and horror. Hewett successfully drew out these extremes, breathing new life into the story with the aid of Orchestra Victoria. This contributed to the accessibility of the production, as did the impressive dance sequence at the end of the play, when Salome performs for her licentious stepfather. 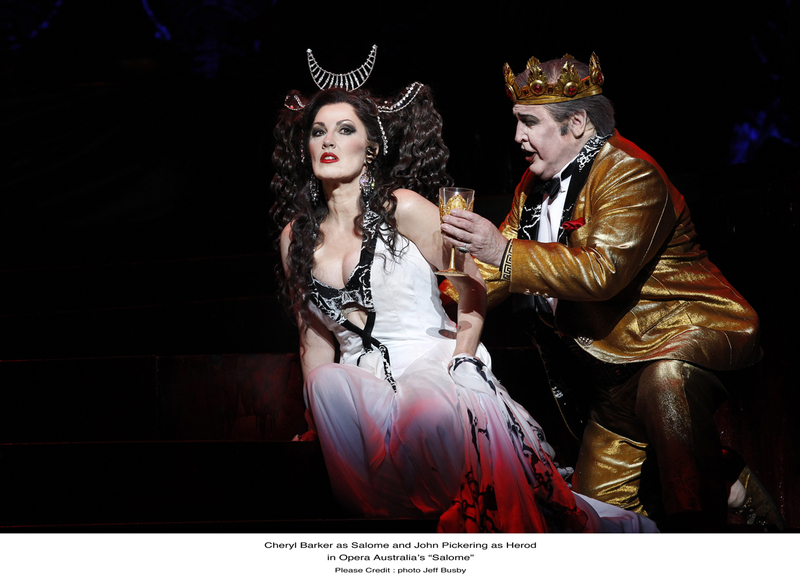 Extravagant, grisly and enthralling, Opera Australia‘s Salome is a triumph. Anyone who has had the privilege of seeing Edwards’ contemporary interpretation of this Strauss classic would not dismiss opera as an ostentatious and antiquated art form, but embrace it as one that has the potential to express the ageless passions, desires and emotions which drive humankind in the most compelling of ways. ‘Salome’ is being performed at the State Theatre, the Arts Centre Melbourne until December 15. See the Opera Australia website for more information about tickets and performances. This entry was posted in Art, Arts, Featured and tagged art, costumes, dance, design, literature, melbourne, music, opera, theatre. Bookmark the permalink.